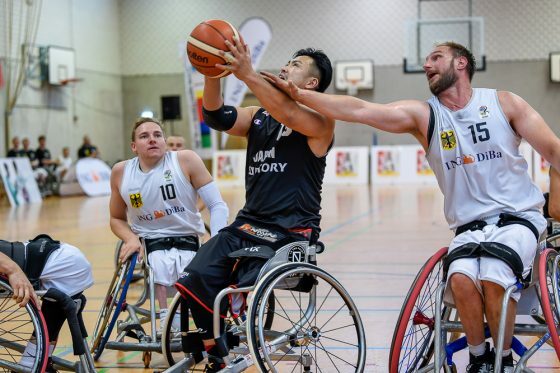 It was a close opening quarter, in what was the first game for the German and Japanese men’s teams at the Nations Cup Cologne, but thanks to some excellent finishing from Japan’s Hiroaki Kozai, Japan were ahead at the end of the first quarter, 14-8. Germany struggled to find a way out of the Japanese press at the beginning of the second quarter, allowing Japan to open up a 16-point lead. Germany’s Head Coach, Nicolai Zeltinger, switched up his line up to combat the press, the new combinations working well to bring it back to an eight-point game at the end of the half, 36 – 28. Japan’s Head Coach, Shimpei Oikawa, introduced a new line-up at the beginning of the third to try and match up with Germany’s height, but to no avail as it was Germany who went on a 10-2 run, helping them to win the quarter, 23 -11, and take the lead, 51 – 47, going into the final period. The fourth quarter, Oikawa, re-introduced the press defence and forced Germany into number of turnovers and mistakes, of which Japan capitalised, winning the quarter 19-13 and despite a last-second effort from Jan Sadler, which was deemed to have been after the final buzzer, Japan took the victory 66 – 64.